“Sustainability” in a product such as SyMAX means much more than reduced energy cost. Due to its lower operating temperature, reduced vibration and noise, and improved reliability, SyMAX provides significantly more benefits to the user. Four major areas we’ll be talking about today are Energy Savings, Reliability and Longevity, Application Flexibility and Performance. The 5 year cost of ownership of a typical 5 HP NEMA Premium induction motor can be broken down into several key pieces. While many buyers focus only on initial acquisition cost, in general this represents less than 3% of the total, with 94% ascribed to energy costs to operate the motor. While this pie chart illustrates a typical 5HP NEMA Premium motor, these general percentages are very consistent regardless of HP rating. SyMAX efficiencies meet or exceed IE4 levels currently being enforced throughout Europe, which are roughly 20% higher than equivalent NEMA Premium levels in North America. Several ratings actually meet or exceed IE5, a level being considered for the UE…which is another 20% higher than IE4. More impressive yet is a PM motor’s characteristically flat efficiency curve, resulting in even higher efficiency levels at reduced loading, versus an AC Induction motor. Unlike an induction motor, whose rotor must be electronically magnetized to cause rotation, the SyMAX rotor is permanently magnetized. Therefore, the motor loss attributed to the rotor, which typically results in about 20% of the motor’s inefficiency, is essentially eliminated. Other efficiency increases are the result of less active material…copper wire in the stator…and shorter stack lengths. 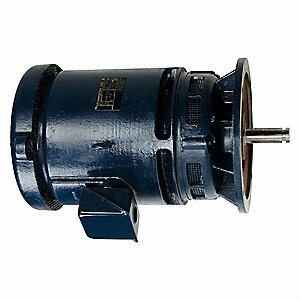 At the end of the day, the most significant gain is in elimination of rotor I2R losses. Selection of the right insulation system which withstands the fast switching speeds common in today’s IGBT drives is critical to providing long, useful and dependable motor life. The Max Guard system, standard on every SyMAX motor, combines the best materials, design and quality standards to deliver long, dependable motor life under the dielectric stress imposed by today’s variable frequency drives, exceeding the requirements of NEMA MG1 Part 31 for inverter-driven motors. Is the drive 600 feet away from the motor? No worries. Marathon’s Max Guard system allows operation at any practical cable distance, at any carrier frequency, on any approved drive. There are two major causes of electric motor failures: windings and bearings. In both cases, heat is a major culprit. The lower operating temperature of SyMAX motors reduces the stress on the motor’s insulation system. As illustrated in the table, the three insulation classes (B, F and H) have a defined, statistically-derived life, which is directly related to temperature. SyMAX commercial rolled steel motors utilize a Class F system with Class B (or less) rise, providing over 5 times the normal insulation life. SyMAX Industrial Severe Duty motors have a Class H system with B (or less) rise, resulting in an insulation life over 30 times longer than normal. Lower operating temperature also favorably impacts bearing life: SyMAX motors, with their lower bearing temperatures, exceeds the stringent IEEE841 standard; at the same time may allow longer re-lubrication cycles. One other source of structural failure is mechanical vibration. Most SyMAX designs exhibit vibration levels half that of “Precision” balance. To ensure the elimination of damaging bearing current caused by the inherent common mode voltage from VFDs, we recommend the optional “BCP”. Motors equipped with “BCP” come with our exclusive “Bearing-to-Bearing” guarantee. If any motor fails within the standard warranty (three years) due to inverter-sourced bearing current, we will replace the bearings…no questions asked. SyMAX provides ultra-high efficiency in a “drop-in replacement” form factor…OR…higher power density for new applications (while maintaining equally high levels of efficiency and performance). Reduction…or elimination…of costly mechanical power transmission equipment improves system efficiency and reduces maintenance, resulting in a more “sustainable” motor/drive system. Additionally, the reduction in frame size results in a smaller footprint and lower weight, providing our customers with the opportunity to reduce the materials required to support the motor. Smaller diameter motors have lower rotor inertia, improving dynamic response in positioning applications. In this illustration, the power rating is identical (10HP, 1800RPM). Whereas an induction motor would be a 215T, with a typical weight of 225 lbs and consuming 3300 sq-in of real estate, SyMAX PMAC can provide the same torque in a 184T, weighing in at 130 lbs and utilizing a 2025 sq-in space…a weight and space reduction of 40%. In some instances, more power is required in an application but with strict form factor constraints. SyMAX to the rescue. Across the product line, SyMAX delivers approximately 2 times the power in the same footprint. The performance envelope for SyMAX includes up to 2000:1 (closed-loop) or 20:1 (open-loop) constant torque, with variable torque capability to zero rpm. The constant power region is limited by the drive’s ability to withstand high voltage transients in the event the VFD loses control at higher speeds, even though the motor can operate faster. Special, “low BEMF” designs can accommodate a wider CHP region but at the expense of system efficiency. As a synchronous motor, one major advantage of SyMAX PM motors is that speed remains constant even under increased loading, resulting in more precise speed and torque control. Induction motors operate at progressively slower speeds as they’re loaded down, until they reach the “break-down” point. Further, SyMAX motors have a higher torque/inertia ratio, providing crisper response to acceleration and deceleration commands from the drive. When high performance is critical, SyMAX is the logical choice. The graph illustrates the dramatic impact of reduced rotor stack length on its inertia, resulting in an average 37% reduction. The result is a significant improvement in the motor’s ability to react crisply to commands from the VFD to start, stop, accelerate, decelerate and change direction. While most centrifugally loaded applications such as fans and pumps may not require the high dynamic response, others such as conveyors, crane & hoist, or other machinery applications benefit from this improved performance element. Note that further improvement is possible when exploiting the potential to down-frame into smaller diameter designs. SyMAX Commercial Rolled Steel frame motors, available from 48 through 215 frame, are jam-packed with features in a cost-effective construction. Our steel frame design includes a robust, heavy gage steel housing, lubricated-for-life sealed ball bearings, the popular Max Guard insulation system and removable base. The comprehensive nameplate provides all required information to quickly and easily program the drive. Motors comply with all applicable NEMA, UL, CSA and CE Standards, and come with a 3 year warranty. 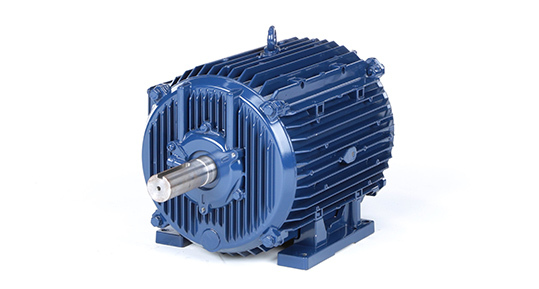 SyMAX Cast Iron Premium Severe Duty motors are utilized in many mission-critical applications, serving many commercial and industrial market segments. The list of standard and optional features meets or exceeds the requirements of the most stringent specifications, including ingress protection from IP54 to IP56, interior and exterior epoxy paint, all cast iron construction, Max Guard and bearing caps. SyMAX motors are UL Recognized, CSA Certified and carry the CE Mark. Options and modifications include blowers, brakes, encoders, and Division 2 Hazardous Location Certification by CSA. Applications that require variable speed, high torque output, high efficiency and productivity, and reduced system cost include these and many others. Many of these have been the domain of DC motors for many years, due to the performance benefits that DC motor systems deliver. Over the last 20 years, many of these traditional DC applications have migrated to AC vector drives and motors, due mainly to the advancement of AC drive technology. The next “game changer” is use of Permanent Magnet Synchronous Machines with AC Drives, as the cost of energy continues to escalate. Note that several applications that have historically utilized a mechanical speed changer (gearbox), due to the torque multiplication, are also excellent candidates for PM motors. The higher power density results in the same power rating (torque) in a smaller physical package, or higher torque in the same size motor.